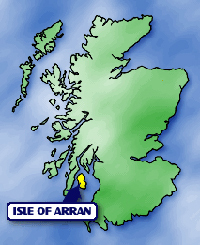 Arran is accessible by two ferry routes, by taking the 'MV Caledonian Isles' (Capacity: 120 cars & 1000 passengers) from Ardrossan to Brodick, or by the smaller ferry operating between Claonaig and Lochranza at the North end of the island in Summer (Winter timetable is via Tarbet to Lochranza). 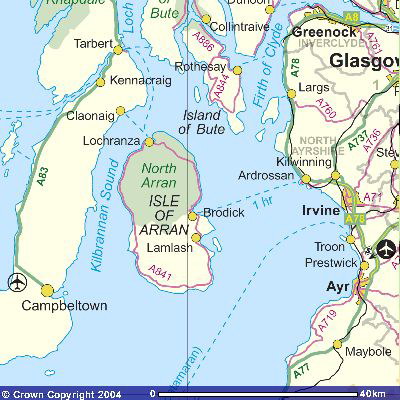 There is a regular direct train service between Glasgow and Ardrossan Harbour. If coming to Arran by car via Ardrossan it is strongly advisable to book in advance, (Ardrossan-Brodick service only). Whiting Bay is just 8 miles south of Brodick. Turn left at Brodick pier and continue through Lamlash and into the village of Whiting Bay. 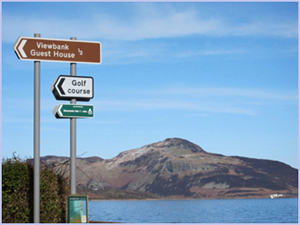 Continue through the village, at the "Coffee Pot" look for the brown tourist board sign for Viewbank House and turn right onto 'Golf Course Road'. Take this road up the hill for 1/2 mile, following the signs for the golf club and Viewbank House. 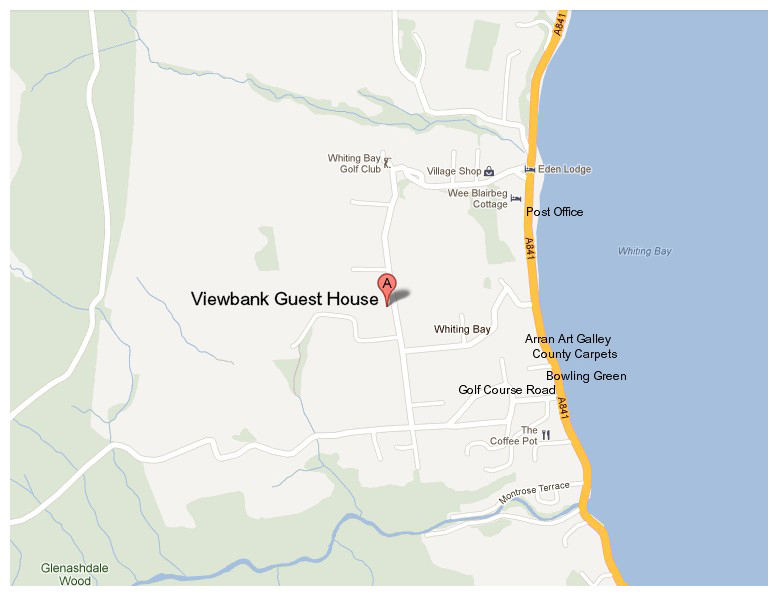 Viewbank House is situated 200 yards before the golf course. 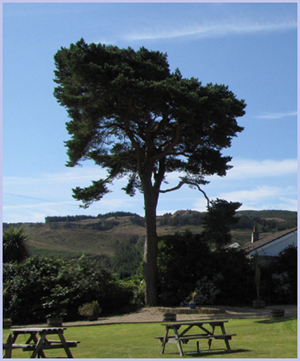 Look out for the large Scots Pine tree in the garden! There is a regular bus service through to Whiting Bay from the Ferry – ask to be dropped off at the "Coffee Pot" cafe. 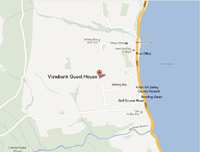 We can provide a 'pick-up and drop-off' service from the bus stops in Whiting Bay – please ask! NOTE: SatNavs can be unreliable in rural areas such as Arran – ignore the instruction to turn right (if arriving from the North) into 'Middle Road' as this is unsuitable for vehicle access – instead continue until the next junction when you will see the signs shown above.